This post is part of my Valentine's Day Guide! Best Man Down is both heartfelt and funny. BEST MAN DOWN makes its way down the aisle on Blu-ray and DVD January 21 from Magnolia Home Entertainment. The film features an amazing cast including Justin Long (“New Girl,” Dodgeball: A True Underdog Story), Jess Weixler (“The Good Wife”), Tyler Labine (Rise of the Planet of the Apes, “Reaper”), Addison Timlin (Stand Up Guys, Derailed), Shelley Long (“Modern Family,” “Cheers”) and Golden Globe nominee Frances O’Connor (“Mr. Selfridge,” The Hunter). 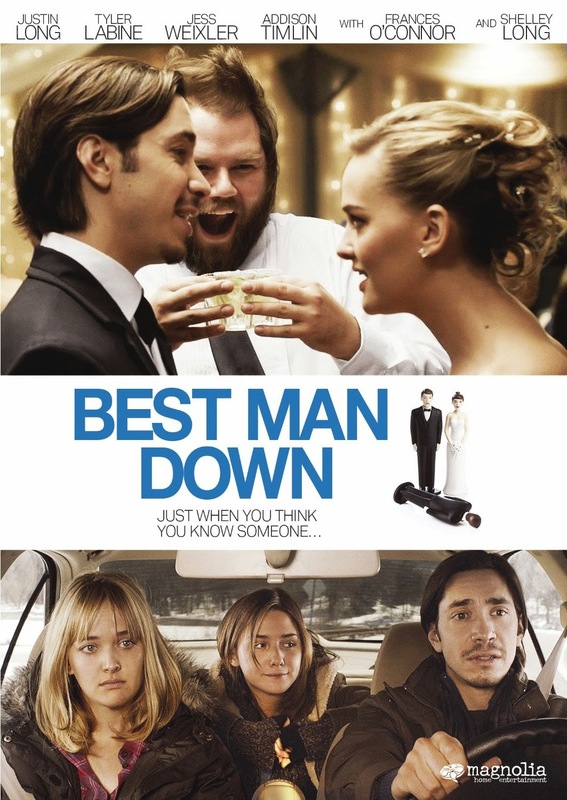 When their obnoxious and over-served best man, Lumpy (TYLER LABINE), unexpectedly dies at their destination wedding in Phoenix, bride Kristin (JESS WEIXLER) and groom Scott (JUSTIN LONG) are forced to cancel their honeymoon and fly home to the snowy Midwest to arrange for his funeral. But getting Lumpy's body back to Minneapolis is just the start of their adventure, as the well-intended sacrifice surprises at every turn. And when the newlyweds' path leads them to a fifteen-year-old girl in a small, northern Minnesota town - all bets are off on who Lumpy really was. My hubby and I really liked it! I wont say its our favorite movie ever, but we both enjoyed sitting down and having a movie night :). I like that it had emotional parts that I enjoyed and humor so my hubby was able to laugh and get his comedy fix. There were times when we were laughing out loud and parts where we were on the edge of our seat hoping everything turned out for the best. I def. recommend this movie in my personal opinions its perfect for a Valentine's Day movie date night :).